Summary: From the glittering streets of Manhattan to the moonlit rooftops of Paris, falling in love is easy for hopeless dreamer Isla and introspective artist Josh. But as they begin their senior year in France, Isla and Josh are quickly forced to confront the heartbreaking reality that happily-ever-afters aren’t always forever. Their romantic journey is skillfully intertwined with those of beloved couples Anna and Étienne and Lola and Cricket, whose paths are destined to collide in a sweeping finale certain to please fans old and new. Isla and Josh. So similar and so different to Anna and Lola. I don’t know if I’ve mentioned this before, but I always felt that Anna and Lola were essentially the same story, with the perspectives flipped (Lola reminded me of Etienne and Anna reminded me of Cricket) essentially the characters are going through the same thing, wanting each other and figuring out how to get that. With Isla and Josh the circumstances are very much different. Isla opens in New York City, on a dark night with a female character who has a stronger voice than I thought she would. Portrayed as quiet and shy in Anna and the French Kiss, I wasn’t sure how she was going to live within her own story; and although I had enjoyed Josh in Anna and the French Kiss, I wasn’t sure he could stand on his own as a romantic lead. Let’s just say my expectations were definitely exceeded. I won’t lie, even with my trepidation towards our main characters, Isla and the Happily Ever After was by far my most anticipated read of 2015. I’ve had it on pre-order since you could have it on pre-order. I follow Stephanie Perkins on twitter and knew about why the release date was pushed back and was in complete support of her, but I’m going to be honest I WANTED THE BOOK IN MY HANDS IMMEDIATELY, as soon as I finished Lola I wanted Isla, so I already had a love for the book before I even read it. The main difference with Isla was this: where Anna and Lola were about the leading up to and very beginning of a relationship, Isla starts off with the beginning and leads us through a relationship; all of the messy, beautiful, funny, and heartbreaking aspects of it. I was afraid Isla would fall short as a protagonist, until I realized that Isla was me. I’ve always felt like my favorite books were the ones when I identified with the main character on a personal level, and I really identified with Isla. I was never confident like Anna, or outgoing and crazy like Lola, sure I wanted to be that way, but I wasn’t (still am not) but I was like Isla. Quiet and terrified of talking to that boy (you know the one. You still check up on him on social media, but if you saw him in real life it would be: ‘do I know you from somewhere? High school maybe?’) I need an extra shot of caffeine to get up the nerve to talk to guys that I really think are adorable, and throughout high school, and most of college I felt like a blank slate – something Isla refers to herself as. Isla was just as heartbreaking if not more so that Anna and Lola, but it was more rewarding too. Josh was perfect, and Isla was perfect for him. There were so many moments in the novel where you realize that these two people are just so incredibly perfect for each other – not just their personalities, but how much they value each other, and how much they realize that the other is perfect for them. Although I got this feeling overall when I read the previous two novels, with Isla you got to see the entire relationship, not just the ‘trying to get to a relationship.’ You get to see the messy bits, and see why it made them stronger. It was an incredible thing to read. The only thing I didn’t like was how much more awareness is brought to the type of people that these characters are. When I read Anna and again when I read Lola I didn’t realize how upper-class these characters must have been. They seem so down to earth – so realistic and middle class, and in this novel it was very apparent that Josh and Isla come from an entirely different world, one of glamour and glitz and lots of money. It wasn’t a negative aspect to the story, but it also played a bigger part in this novel than in the previous two (I don’t know any kids, who can afford to run off to Barcelona, regardless of whether they’re living in Paris or not). Did their personalities reflect this? No, not really, but there were situations in the book that did and that made it seem less realistic than the first two novels. 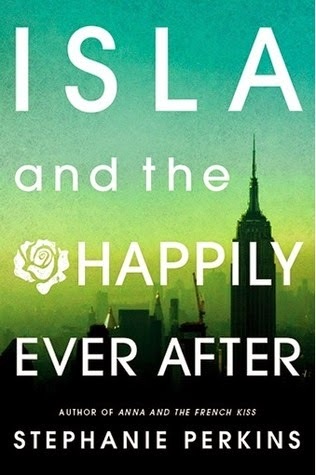 Overall I loved Isla and the Happily Ever After, I loved it just as much as Anna and Lola. I loved that we got cameos from our favorites (OMG YAY!!! I mean, you’ll know the moment I’m talking about, but AKJDHSKJGHOIH!!!!) and that the truth was in the title, even though it wasn’t always there. I just think if you loved Anna and Lola you’re going to automatically love Isla for all of its similarities, but most importantly for its differences.